The 2018–2019 Endowed Chair of Women's and Gender Studies Robyn C. Spencer. Photo by David Rozenblyum '07. 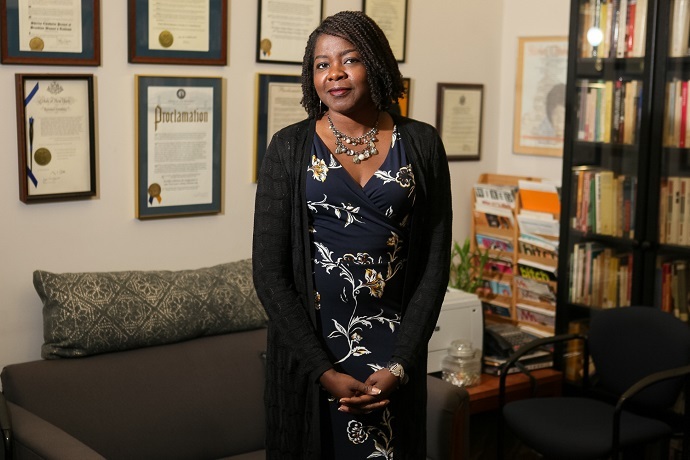 "There is a direct relationship between the erasure of black radical women from history and the lack of imagination that is currently available in terms of how we think about what leadership looks like, what survival strategies look like, and what resistance looks like," says Robyn C. Spencer, the 2018–2019 Endowed Chair of Women's and Gender Studies. "If we don't know about that history, then we are hamstrung in how we understand the present and think about the future." That inquiry is the basis of her curriculum at the college. Challenging Erasures is a series of free and public campus events that seek to "reinscribe black women's histories in space, place, and time," particularly in New York. Spencer points to public responses and reactions to contemporary black woman leaders to clarify what she means. "Even now, there are calls for leadership, and when those leaders show up in black woman form, we employ language to neutralize their effectiveness. Maxine Waters should not be referred to as 'Auntie Maxine.' She's enacting a strategy of resistance. She's not our aunt. She's a leader. And we don't regard male leadership in similarly dismissive ways." Spencer, the author of The Revolution Has Come: Black Power, Gender, and the Black Panther Party in Oakland (Duke University Press Books, 2016), was born in Minnesota to Guyanese parents and spent her first three years in Ann's Grove, Guyana while her parents remained in the United States to work. When she returned to the states, her family had moved to Brooklyn where she was raised. She currently resides in the Bronx. Spencer is the author of 'Black Feminist Meditations on the Women of Wakanda' and appeared on Democracy Now! to discuss the blockbuster Black Panther film that inspired her essay. The first in her family to go to college, Spencer attended State University of New York (SUNY) at Binghamton where she started out as a pre-med student before following her true interests and switched to her major to history. "In a Caribbean family, the question is always, 'What kind of doctor or lawyer are you going to be?'" says Spencer. After graduating, she attended Columbia University under a full academic scholarship, and received her Ph.D. in history. Visiting from Lehman College, where she is an associate professor of history, Spencer came to Brooklyn College to examine the borough of Brooklyn, as well New York City as a whole, which she loves and believes is imperiled by forces that make it unlivable for the very marginalized communities that are the city's lifeblood. She saw her appointment at Brooklyn College as a tremendous opportunity in the same vein as the endowment's mission: to demonstrate a commitment to diversity and inclusiveness through research, teaching, and/or service; teach and advise students in four courses during the year; and build the visibility of the program by organizing workshops, lecture series, and public discussions that involve students, faculty, and community members. Spencer's first lecture, "From Westchester to the World: Patricia Murphy Robinson and Black Feminist Anti-Imperialism," uncovered the work of the activist through a panel discussion with the women who created a documentary film about Robinson titled, Pat: A Revolutionary Black Molecule. A packed room of students, faculty, staff, and local community members had the chance to see excerpts of the film and speak directly to director and executive producer Lupe Family, and editor and creative director Emilia A. Ottoo. 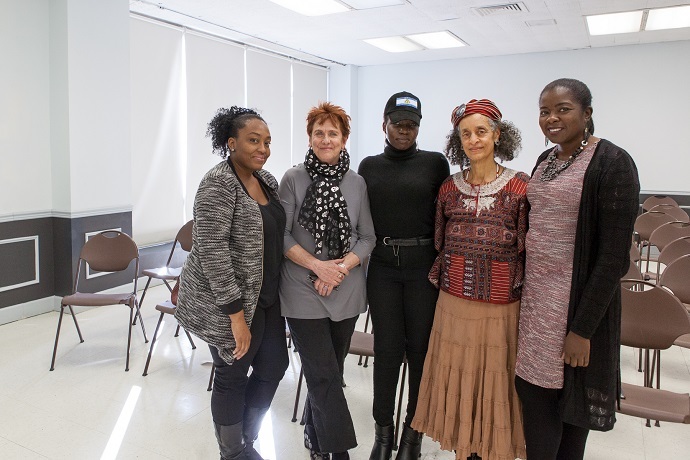 From left to right: Director of the Shirley Chisholm Project on Women's Activism Zinga A. Fraser, former Shirley Chisholm Project Director Barbara Winslow, artist/activist Emilia A. Ottoo, and activist/filmmaker Lupe Family at the 'From Westchester to the World: Patricia Murphy Robinson and Black Feminist Anti-Imperialism' lecture in October 2018. Photo by Craig Stokle. "Pat was a unique and transcendent human spirit aside from her timeless and critical work as a writer, therapist, activist, and network builder," Ottoo says of Robinson. "Her thorough demonstrations in loving people where they are, connecting historical dots, doing your own research, and understanding human power are directly applicable to today's landscape. She had the 'cheat codes' to beating the game that tries to beat you. We also have countless amounts of women's voices, stories, and social contributions unseen and unheard, and Pat is a blockbuster of a puzzle piece." "How can I put back the histories that have been erased?" Spencer asks. "To make people think twice that on this land, these amazing things happened—'this was a site where people resisted' or 'this was the office of a community organization' or 'this community mobilized for equitable public education?' I want to bring back those histories because things are changing so rapidly that the younger generations wouldn't even know what transpired. This erasure would be their normal. I believe in progress; it's not that I want to freeze the hand of time, but I see these as acts of displacement, colonization, and 'push-out,' and I want [students] to have the tools to approach these conditions with historically rooted methods of sociopolitical resistance." Spencer is currently working on three books: To Build the World Anew: Black Liberation Politics and the Movement Against the Vietnam War; Left Traces: Patricia Robinson and the Archive of Black Women's Radicalism; and Angela Davis: Radical Icon. Her essay, "Black Feminist Meditations on the Women of Wakanda," can be found on Medium.com. The Challenging Erasures series resumes on Tuesday, March 5, with "Beyond the Shooting: Eleanor Gray Bumpurs, Identity Politics, and Community Activism," which examines the police shooting of Bronx, New York resident Eleanor Bumpurs. A full listing of Spencer's programming is available on the women's and gender studies website.